Canadian Solar Inc. (CSIQ – Free Report)	recently announced that along with Signal Energy it will offer Engineering, Procurement and Constructions (EPC) services for the Darlington Point Solar Farm (DPSF) in New South Wales, Australia. Canadian Solar will also supply solar modules to this Australian solar plant. The DPSF project has been awarded to Canadian Solar by Edify Energy and Octopus Investments — two venture capitalist that finance renewable energy development programs. The DPSF has the potential to accommodate up to 275 megawatt (MW) of solar photovoltaic electricity generation. Construction of the farm will begin in March 2019, wherein more than 820,000 of Canadian Solar’s high efficiency HiKu modules will be installed. The plant is projected to be complete by early 2020. On completion, the solar plant will be able to light up more than 115,000 homes in New South Wales and displace nearly 600,000 tonnes of carbon dioxide emissions annually. Realizing the need to reduce greenhouse gas emissions, the government of Australia has been undertaking various initiatives to expand the renewable generation portfolio. The country’s Clean Energy Regulator allocated more than $2.29 billion fund toward renewable energy, post the seventh Emissions Reduction Fund auction. Thanks to plummeting costs of installation along with improved technology, the solar market is booming significantly in Australia. According to a report by Energy Matters, the number of Australian solar power installations reached the landmark figure of 2 million, a milestone for the country’s young solar industry. Meanwhile, per a new report released by the International Renewable Energy Agency (IRENA), Australia stands to benefit from the shift to global renewable energy. In this backdrop, we believe that the latest agreement comes as a great opportunity for Canadian Solar to reap benefits from the expanding Australian solar market. In line with this, we can expect the company to win more such agreements by virtue of its high efficiency and industry-leading 1500V and 400W multi-crystalline solar modules. 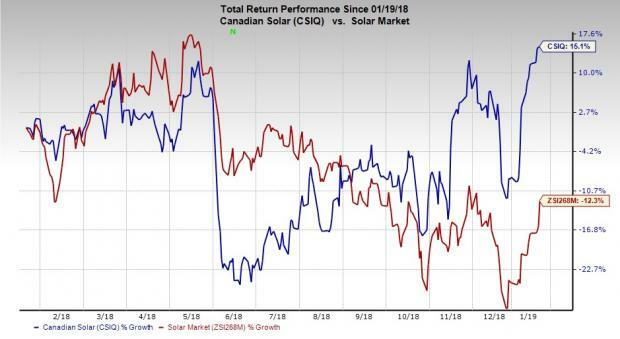 In the past twelve months, shares of Canadian Solar have rallied 15.1% against the industry’s 12.3% decline. Canadian Solar carries a Zacks Rank #2 (Buy). A few other top-ranked stocks from the same space are Azure Power Global Ltd. (AZRE – Free Report)	, Renesola Ltd. (SOL – Free Report)	and SunPower Corporation (SPWR – Free Report)	, all of which carry a Zacks Rank of 2. You can see the complete list of today’s Zacks #1 Rank (Strong Buy) stocks here. Azure Power Global delivered average positive earnings surprise of 76.07% in the preceding four quarters. Its earnings growth estimate for 2019 currently stands at 83.08%. Renesola delivered average positive earnings surprise of 377.78% in the trailing four quarters. The Zacks Consensus Estimate for 2019 earnings has climbed 30% to 13 cents over the past 90 days. SunPower delivered average positive earnings surprise of 53.13% in the last four quarters. For 2019, its long-term earnings growth estimate is projected at 75.09%.